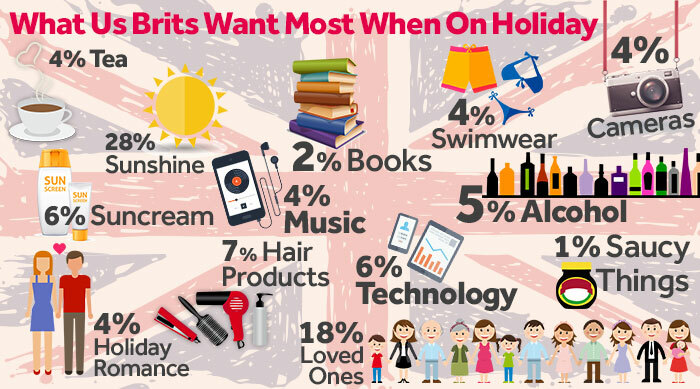 What's The One Thing You Can't Live Without On Holiday? In September we asked you the question, ‘What’s the one thing you can’t live without on holiday?’, and you replied in force with answers ranging from the obvious to obscure to just plain odd! It may not come as a surprise that more than a quarter of vitamin D-starved Brits rated sunshine as the one thing they can’t do without, but some of the other results were a little more unexpected. While 18% of you gushed that your holiday would be nothing without your other half, some of us are still looking to get temporarily swept off our feet, naming a whirlwind romance as the holiday essential. Maybe this explains why so many of you ladies also refuse to leave home without your hair straighteners and make-up! One thing we definitely can’t argue with is that you love your home comforts; some of the most popular essentials include hair products, Kindles and Marmite. Many of you miss starting the day with an English fry-up, and some respondents admit to missing British TV when away. However the most popular reminder of home, beating all other beverages including water, wine, beer and sangria, is - you guessed it - tea! Many of you even shove a box of your favourite tea bags into your suitcase, just to make sure you’re never without your favourite brand of brew. We are British after all.